It's been so long since there has been a truly scary movie that doesn't rely on scenes that are designed to make you jump and giggle. A movie that will get under your skin and visit your dreams. 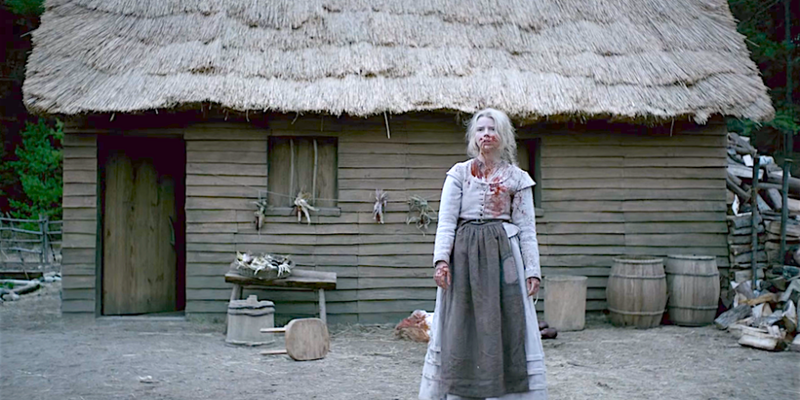 The new feature written and directed by Robert Eggers tries really hard to be that film. The atmosphere, the music, the sets, costumes and the language spoken by the characters lends an authentic weirdness that gives one hope that something really creepy is going to happen. Eggers has an eye for details from the hand sew clothing and the even the eating utensils. Everything is painstakingly on point. One just wishes there was more to the story. It's the 17th century and life is run tightly in a small Puritan village. One particular family is banished from the patriarch's refusal to kowtow to the leaders. They pack their meager belongings and leave the safety of the fortified plantation to the unknown countryside. They rejoice to find a pretty setting at the edge of a wood to build their new life. Things seem to be doing well for a time, but one day while their oldest daughter Thomasin (Anya Taylor-Joy) is playing peek-a-boo with the her infant brother when he mysteriously disappears. Things begin to fall apart for the family quickly afterwards. The mother, Katherine (Kate Dickie) stays in her bed crying and praying. Her father William (Ralph Ineson) worries about their crop of corn not being able to get them through the winter and takes out the oldest boy Caleb (Harvey Scrimshaw) to check on their animal traps in the woods. While Tomasin is left the care of the young twins Mercy and Jonas (Ellie Grainger and Lucas Dawson) who misbehave and tease the black horned goat they call Black Phiilip. The overly devote Calvinist parents constantly preach their brand and gloom and doom to their children feeding the superstitious fear of witches for anything unexplained. So when Thomasin scares the twins by telling them how she made a pact with the devil, they all scream that she is a witch when bad luck seems to befall them. Their fear and paranoia runs amok leading to an ultimate tragedy. The naked crazy lady in the woods (Bathsheba Garnett) that is apparently the source of their trials is never fully explained. The real devil is the human failings of pride and an blind adherence to some religious dogma that seems to perplex people even today. Anya Taylor-Joy is wonderful as the young girl who is becoming a woman. Her awareness of her world turning in on its self is amazing to watch as everyone she loves attack her. The parents are equally disturbing as they wallow in their guilt and prayer hoping for redemption they wouldn't have found even if it slapped them across the head. The film won the Directing Award at the 2015 Sundance Festival which gives it some cred. But for non festival viewing movie goers, it may be too slow and ponderous with the Early American language of thee's and thou's. But one thing you will find most disturbing of all will be those weird twins.